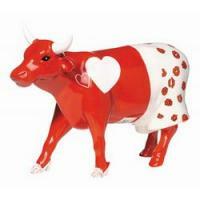 Moocho Amor | CowParade New Figurines | One Price Low Flat Shipping! From the Cow Parade Medium Figurines Collection, Moocho Amor. Featured at the CowParade New York 2000 exhibit. Made of ceramic. Measures 4" x 6"
This delightful cow figurine is wearing high heeled white shoes with a big white heart on its side and has on boxer shorts with red hearts all over them!